It has been requested that this article be rewritten and expanded to New special moves in Ultimate. 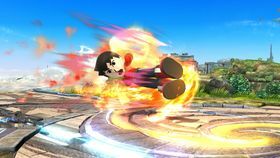 The Mii Brawler appears out of a burst of fire. A Mii Brawler in Super Smash Bros. for Nintendo 3DS / Wii U. The Mii Brawler is a variation of the Mii Fighter that appears as a playable character in Super Smash Bros. for Nintendo 3DS / Wii U and Super Smash Bros. Ultimate. It is one of the three different Mii Fighters available in the game. 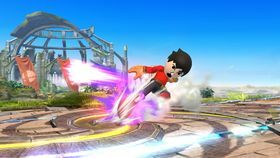 As its name suggests, the Mii Brawler focuses more on hand to hand combat rather than weapons and most of its attacks involve punches and kicks. 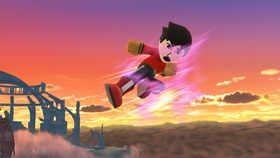 Mii Brawlers also move faster and jump higher than the Mii Gunner or Mii Swordfighter. Unlike other fighters in Super Smash Bros. for Nintendo 3DS / Wii U (aside from Palutena), the Mii Brawler's custom moves are completely different moves in total, rather than being altered versions of their default moves. Along with moves, the player can also customize the Mii Brawler's outfit and hat. Like the other types of Miis, Mii Brawlers cannot be used when playing With Anyone online, but can be used when playing With Friends. The Mii Brawler's standard special moves are Shot Put, in which the Mii tosses a shot put; Ultimate Uppercut, in which the Mii charges a powerful uppercut punch; and Exploding Side Kick, which involves the Mii performing a flaming kick attack. Their side special attacks include Onslaught, in which the Mii dashes across the ground and kicks any opponents in its path; Burning Dropkick, in which the Mii charges a flaming dropkick attack; and Headache Maker, in which the Mii leaps up and slams the ground with its fists. 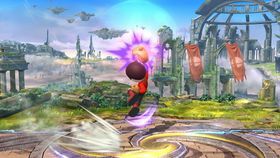 The Brawler's up special moves are Soaring Axe Kick, in which the Mii leaps into the air and back down with a kicking attack; Helicopter Kick, which involves the Mii performing a series of spinning kicks; and Piston Punch, in which the Mii leaps into the air with a series of punches. 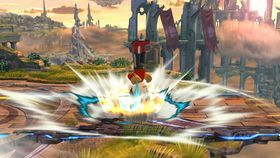 Finally, the down special moves include Head-On Assault, which involves the Mii attacking by slamming the ground head-first; Feint Jump, in which the Mii jumps and can perform a kick attack from behind; and Foot Flurry, in which the Mii dashes across the ground with a series of kicks. The Mii Brawler's Final Smash is Omega Blitz, in which the Mii sends opponents into the air with a punch to deliver a series of punches and kicks. In Super Smash Bros. Ultimate, like the other Mii Fighter types, Mii Brawlers have been somewhat redesigned, and their proportions can no longer be adjusted. In addition, equipment can no longer be used on them (although spirits can). 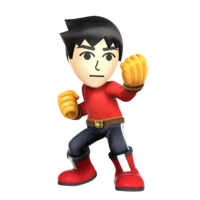 Mii Brawlers also have four new special moves, namely, Flashing Mach Punch; Suplex; Thrust Uppercut; and Counter Throw. These moves replace Ultimate Uppercut, Headache Maker, Piston Punch, and Foot Flurry, respectively. Shot Put (written Shot-Put in the PAL release) is the Mii Brawler's default standard special move. 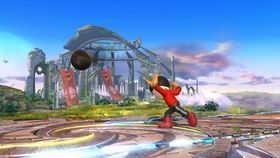 Similar to an actual shot put, the Mii throws a shot a short distance to damage opponents before it disappears. While it can damage after it hits the ground, it deals more damage if it hits them while it is still in the air, and deals less damage every time it bounces off of a surface. Ultimate Uppercut is the Mii Brawler's second standard special move in Super Smash Bros. for Nintendo 3DS and Wii U. The Mii Brawler charges a punching attack when the special attack button is pressed, and attacks with a jumping uppercut punch when the button is pressed again. Like other charging moves, the player can dodge and shield to stop charging, and resume by pressing the special attack button again. While the attack is charging, the player is invulnerable to knockback from weaker attacks. If the Mii is still in the air after the punch is used, they are left in a helpless state. Exploding Side Kick is the Mii Brawler's third standard special move. 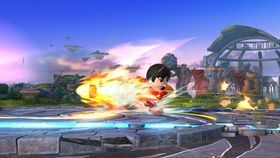 The move operates similarly to Captain Falcon's Falcon Punch, in that the Mii briefly charges a powerful flaming kick attack that slightly brings them forward. 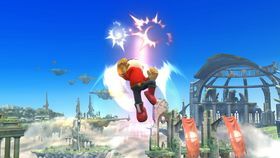 The player can also tilt the control stick to change the direction in which the attack is used and execute it while in midair, though unlike the Falcon Punch this deals no extra damage. However, the move does deal more damage if the opponent is hit closer to the Mii's body. The Mii also has super armor during certain parts of the attack. Onslaught is the Mii Brawler's default side special move. 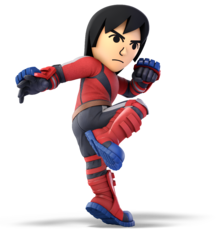 When used, the Mii Brawler charges across the ground knee first, and if the player hits an opponent the Mii attacks with several kicks followed by an uppercut. 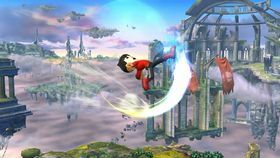 If used in midair, the Mii rises into the air when attacking an opponent, and the Mii is left helpless after the move ends. Burning Dropkick (Burning Drop Kick in the PAL release) is the Mii Brawler's second side special move. The Mii leaps across the screen in a flaming kick. 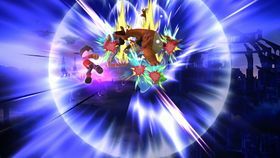 The move can be charged by holding down the special attack button, increasing the distance traveled and the damage dealt. The move charges faster if executed like a smash attack. Headache Maker is the Mii Brawler's third side special move in Super Smash Bros. for Nintendo 3DS and Super Smash Bros. for Wii U. 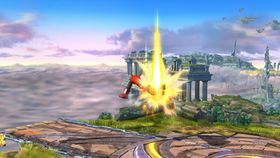 When used, the Mii jumps into the air and slams back down with their fists which damage any opponents underneath (potentially meteor smashing them). The player can also execute the downward attack sooner by pressing an attack button. The Mii also moves further horizontally if the move is used in midair than when used on the ground. If used from high enough, the move will do less damage the further the Mii travels down and eventually will end, leaving them in a helpless state. Soaring Axe Kick is the Mii Brawler's default up special move. The Mii kicks up and leaps into the air, immediately followed by falling back to the ground with an axe kick. 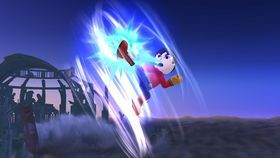 Hitting an opponent under the Mii's leg while performing the axe kick deals a meteor smash. Helicopter Kick is the Mii Brawler's second up special move. The Mii delivers a series of spinning kicks that ends with a powerful finishing kick. The move provides more horizontal movement than vertical, and the player can control their movement with the control stick while performing this move. Piston Punch is the Mii Brawler's third up special move in Super Smash Bros. for Nintendo 3DS and Super Smash Bros. for Wii U. 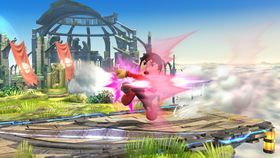 The move involves the Mii rising into the air with a series of punches, similar to Little Mac's Rising Uppercut, and dealing multiple hits to any opponents caught in the attack. Head-On Assault is the Mii Brawler's default down special move. The Mii leaps into the air and forward a short distance, dealing slight damage and knockback, and then slams into the ground headfirst, which buries nearby opponents. If used in the air, the Mii immediately flies toward the ground. The move also meteor smashes any opponents under the Mii's head as they descend. Feint Jump is the Mii Brawler's second down special move. Similar to Zero Suit Samus's Flip Jump and Sheik's Bouncing Fish, the Mii leaps into the air in a front flip, and by pressing an attack button during the move the player performs a forward-moving kick to attack. Foot Flurry is the Mii Brawler's third down special move in Super Smash Bros. for Nintendo 3DS and Super Smash Bros. for Wii U. The Mii moves across the ground in a series of kick attacks, finishing with an upward kick that knocks opponents away. If the move is used in the air, the Mii instead attacks with a series of downward kicks and finishes with a side kick that still knocks opponents away. When using the aerial version the Mii remains floating in place the first time the move is used, though during subsequent uses the Mii falls like normal. Omega Blitz is the Mii Brawler's Final Smash in Super Smash Bros. for Nintendo 3DS and Super Smash Bros. for Wii U. When activated, the Mii Brawler uppercuts their opponent, sending them into the air. The Mii then jumps to the opponent and delivers multiple punches and kick combos, with a rising triple spin kick at the end. The Final Smash finishes with a strong impulsive chop that launches the foe downwards, dealing high knockback. Wii U Super Smash Bros. for Wii U This fighter is based on a player's Mii. It excels at fighting with punches and kicks. This type of Mii is very agile, blending attacks with movement to get the battle flowing. It has superior dash and jump compared to other types. Stay close and keep whaling on foes - you'll KO them in no time! A Fighter based on your Mii! Brawlers focus on kicks and punches, and a lot of their specials send them hurtling towards opponents. They're better at dashing and jumping than other types of Mii Fighter, and their speedy attacks really pile on the pressure at close range. And, just for good measure, they can also lob shot-puts! Wii U Super Smash Bros. for Wii U Shot Put is the only projectile attack a Mii Brawler can have. It drops quickly and only bounces a tiny bit. Try using it on foes hanging off an edge to knock them off. The down special Head-On Assault can bury enemies in the ground. It also sends the Mii Brawler downward-don't KO yourself, too! Shot-Put is the only projectile attack a Mii Brawler can have. It drops quickly and only bounces a tiny bit. Try using it on foes hanging from the stage to knock them off. The down special Head-On Assault can bury enemies in the ground. It's also a kind of meteor smash, but if you use it while off the stage, you'll probably KO yourself, too. N/A Mii Brawler's Final Smash will strike opponents with a powerful uppercut and then deliver a rush of attacks in midair. If the uppercut misses, the rush of attacks will fail as well. However, there is no escaping this move once caught in it. The final blow consists of kicking opponents down and bouncing them off the stage. In this Final Smash, Mii Brawler lifts a foe into the air with an uppercut, then delivers a barrage of strikes. If the initial uppercut misses, the whole thing stops there - but if it hits, the other blows can't be dodged. It ends with a series of kicks followed by a chop, sending the victim smashing into the ground and bouncing way up high. Blue indicates the Trophy or description is exclusive to the Wii U version. Pit: Tell me about this fighter. Palutena: Here we have a Mii Brawler. Pit: This fight's gonna be really easy if my opponent's unarmed. Viridi: Listen to Mr. Tough Guy here! That's pretty presumptuous that this fight's already in the bag! Pit: Oh, like you're one to talk about looking down on others. Palutena: But Viridi's right. You can't underestimate this foe. The Mii Brawler is far from being "unarmed." Those fists are weapons in and of themselves. They pack a real punch, so you could watch out for even straightforward moves like the side smash. Pit: Ok. Ok. No talking trash about any of my opponents. At least not until after the fight! All three classes (Brawler, Swordfighter, Gunner) have similar site descriptions. Mii Fighters are playable characters in Super Smash Bros. for Wii U and Nintendo 3DS. They are based on a player's Mii character—so anyone can join in—and you can outfit them with fun costumes. There are three different types (Brawler, Gunner, and Swordfighter), and each one brings a different fighting style to the battle! This page was last edited on March 19, 2019, at 04:21.